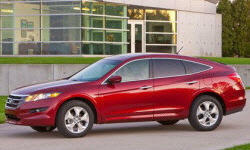 Honda Crosstour Pros and Cons | Page 1 of 1 | Why Not This Car? What drives people to buy (or not buy) a certain car? TrueDelta's members share Honda Crosstour pros and cons based on their real-world driving experiences. I'm tall - 6-6" - and this is the roomiest and most comfortable car I've ever owned. Comparable to a Yukon for a driver. Great room inside at all seating positions for me. Sleek, Pictures do not do it Justus. You have to see it in person. The Crosstour looks sleek and a must see in person. Pictures do not do it justus.